Our summer of the Grigio stays in high gear as we enjoyed this light summer fare at the end of a sultry Sunday afternoon. 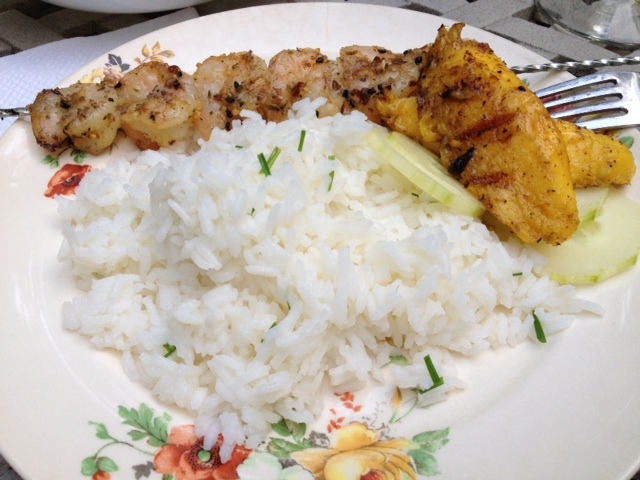 We pulled together some delicious shrimp on the grill, where we also blazed up some fresh mango to go with a fresh salad and jasmine rice. The Domani was predictably enjoyable. Not an earth-shattering success by my standards, but a solid double into the gap. The mango was an experiment; I’d rather have it fresh and cool than grilled in the future but it did work well. The rice and shrimp, though, were definite highlights.